Cancun International Airport is one of the important and busiest airports in the Caribbean. It is located in Cancún, Quintana Roo, on the Caribbean coast of Mexico's Yucatán Peninsula. With over 12 million visitors each year, it is the second busiest airport in Mexico after Mexico City International Airport in Mexico City. In 2011, 13,022,481 passengers used Cancun International Airport. As it has become one of the most important international airports in the country, Cancun airport has been expanding to accommodate the increasing number of international passengers. New mega-resorts are also being constructed around the airport area to attract large number of international visitors. As the two operative runways in Cancun airport are 1,500m apart, they are used simultaneously. Cancun airport also has three commercial terminals. Charter airlines from North America, including domestic charter airlines use Terminal 1. Terminal 2 is used by some international airlines, as all of the scheduled domestic airlines, and new Terminal 3 is used for international operations of airlines from North America and Europe. 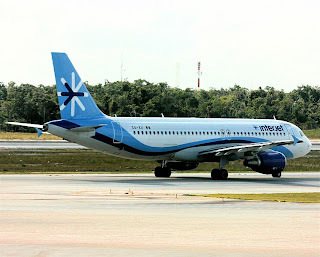 Every day charter airlines and major international airlines have direct or connecting flights to Cancun airport. The airport is well-equipped with modern facilities such as first class shops, restaurants and parking slots. Cancun international airport is also used by cargo airlines such as Amerijet International, FedEx Express, Regional Cargo and Estafeta Carga Aérea . Grupo Aeroportuario del Sureste operates the Cancun airport together with Cozumel International Airport, Mérida International Airport, Veracruz International Airport, Villahermosa International Airport and Xoxocotlán International Airport. ASUR announces that Terminal 2 expansion is expected to be completed by 2013, while expansion of terminal 3 will commence after the completion of terminal 2. Cancun airport is 90 minutes from Tulum, 45 minutes from Playa del Carmen and 2 hours from Chichen Itza.